Pocket Console just got flooded with all of our pending interviews at once. 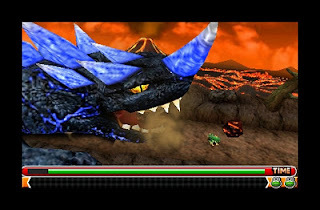 This Frogger interview was submitted before the game was released, so some of the questions might be a little dated, but the information is still hopefully interesting to you. With that said, we would like to thank Konami for the interview. Now let's hop to it with Frogger 3D. First off, thank you for taking the time to talk with us today. I wanted start by getting an idea about the development of Frogger 3D. I was just curious about the team behind this project. Who else is involved with the development? Is it an internal Konami team or an external developer? What prior games has this team worked on? Tak Fujii (Producer): The original and basic concept was conceived by us, KONAMI, and we asked Alpha-Unit, a developer in Tokyo, to work on the game for us. We have partnered in several projects in the past and they have good knowledge of handheld devices. Above all, they have deep love for classic 8 bit games, including Frogger. Alpha-Unit developed Foto Showdown for Nintendo DS just before Frogger 3D, and various videogames for other console and handheld devices as well. It's the 30th anniversary of Frogger. How much of an impetus was this for the creation of Frogger 3D? Tak: "30th" anniversary in "3D"! We can make a 4D version of Frogger when we hit the 40th anniversary - only if we figure out what we can do in "4D" in the next 10 years! 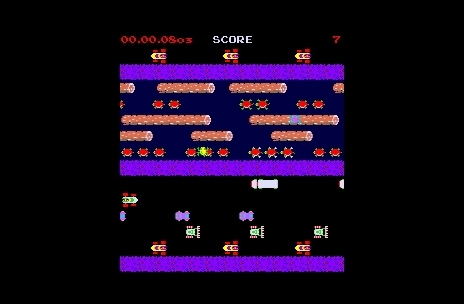 There have been a lot of Frogger games over the past thirty years, with even quite a few showing up over the past few years. Pardon the pun, but does Frogger still have legs in this day and age? Tak: Yes. 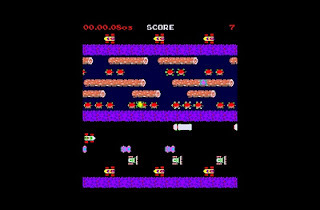 Many people have known Frogger since their childhood. We thought this was a great opportunity to bring Frogger back to them, to share their memory and skills with their kids and and so on. What spurred the decide to drop the anthropomorphic Frogger in favor of the classic look? Tak: Because this is rather a homage to the classic Frogger. 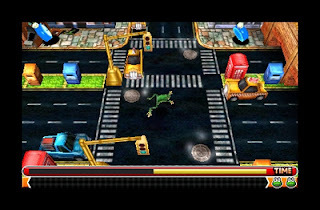 The classic powerless frog to cross the road, is what we all wanted for this Frogger and the game design to be. If your frog is a bipedal vertebrate intelligent enough to verbally communicate and wear a nice pair of pants, all you have to do is tell it to grab a cab to get to the destination. I personally like a natural amphibian better. Could we get some details on all of the wireless multiplayer and Stress Pass features? Transferring record via Street Pass is one thing I've heard about, but what about other multiplayer and social features? Tak: "Forever Mode" is the one for StreetPass. You play the pure classic-looking Frogger, just that it does not have a goal. You travel as far as you can, while traffic and rivers gets harder and harder to cross. Your best record and the path taken will be transferred to other players via StreetPass. I must say this is very addictive and really fun to share your ghost data with your local friend. This is really simple, and at the same time very competitive. "Multi Play Mode" is the mode played by up to 4 people simultaneously, all aiming for the goal. 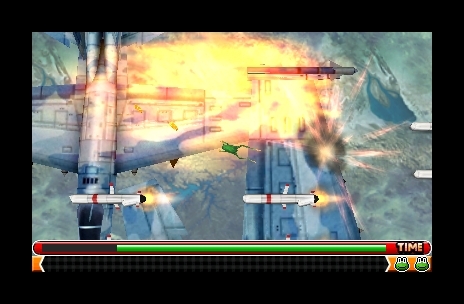 The main feature of this mode is the Key. You have to hold the Key in order to unlock and enter the goal. If hit by another player, you drop the Key and the attacker grabs the key. You can just sit around by the goal until other players fetch the Key from the far end of the level, because someone has to bring it to the goal anyway. There are also traffic you have to dodge and run from, making it hard just to stand-by. Played by full 4 players, this mode is really chaotic and fun. Plus, you can earn more coins in Multi Play Mode than in Single Mode, so if you are stuck in any level in Single Mode, play Multi to quickly gather the neccesary amount of coins and unlock the new levels. What's the deal with the special Frogger 3D bundle? Is it a special limited edition item? Here at Pocket Console, our focus is to highlight the console-style experience that portable consoles like the 3DS offer. Right now there are two Frogger titles available on iOS as well as Frogger Returns on PSN and WiiWare, all at a low price point. How do you think Frogger 3D will thrive in this market, especially at a $29.99 price point? Tak: We have been working on this project ever since the 3DS release was announced. We expected $29.99 would be a bargain price for the latest portable console, but iOS and Android kept expanding their share in the video game market much faster than we thought and yes, we even had to consider how we handle the console game business. However, I am confident that $29.99 is still a bargain for what you experience, compared to downloadable Froggers that value quick and easy gameplay. I, myself spend more than 20 hours to complete all the levels and the trophies in Frogger 3D, and I believe people who used to play and love the classic Frogger will understand what I mean. I imagine this will not be the last we see of Frogger. Any more plans for the franchise after Frogger 3D hits? Any thoughts of branching it off into other genres? Pearl Lu (Frogger Brand Manager): You bet! Stay tuned! Pocket Console would like to thank the crew at Konami for answering our questions. Frogger 3D is out now on the Nintendo 3DS, so feel free to check it out for yourself.